We are now incredibly close to beginning the new school year and it's all getting very exciting! I popped back into school for a couple more hours to make some late additions to my increasingly busy classroom. 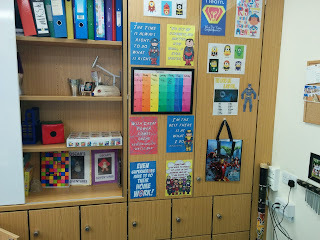 Here are some organisers that I decorated to fit in with the superhero theme. My dad was throwing out a lot of old comics and (after checking if any were rare and valuable!) I hastily grabbed them and started to tear them up. I used modpodge to glue comic pieces onto the cardboard. I'm very happy with the final products and they will slot into the room seamlessly. I got some of these small, metal buckets from Amazon for around £5. 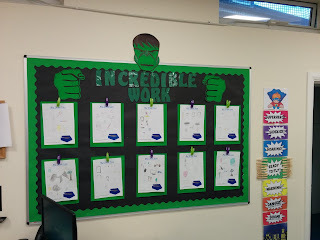 The children are going to be given a lot of homework each week so I plan to use this as a way of knowing who has and hasn't handed in their work. Each child will be assigned a number on the first day and this will be used in many different areas of the classroom. 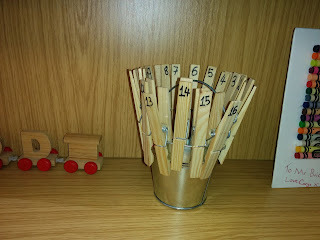 When they hand in their homework for the day, the child removes their peg from the brim of the bucket and then places it inside. 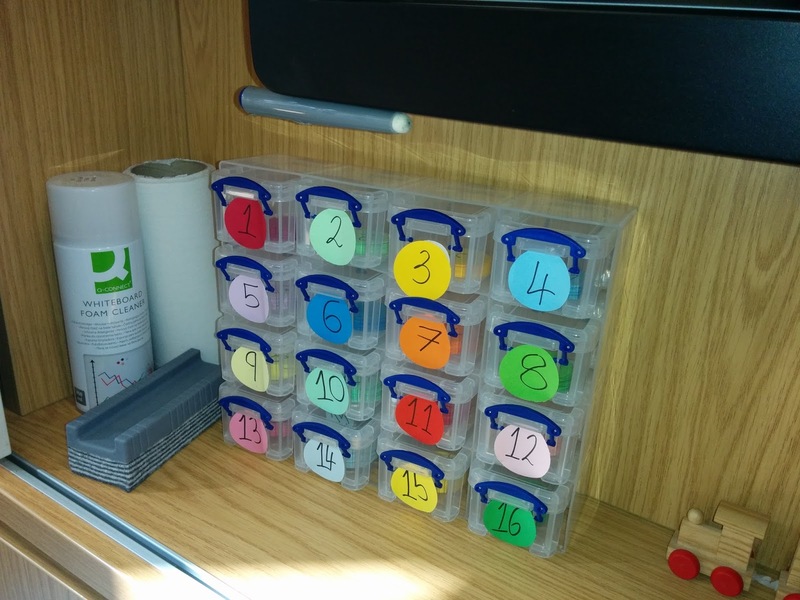 This allows me to quickly ascertain which students have not completed the task. 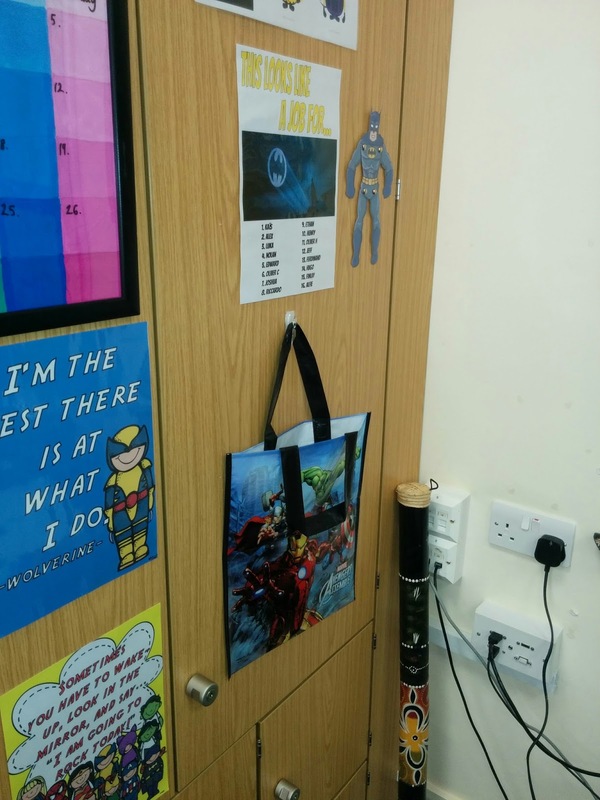 I've slightly changed around my teacher corner. 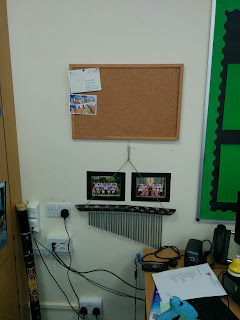 I've hung a cork-board up to act as a notice board and have finally added my chimes that I love to use as a peaceful way of telling the children to be quiet. You can see a couple of postcards that two of my new children sent me from their summer adventures! 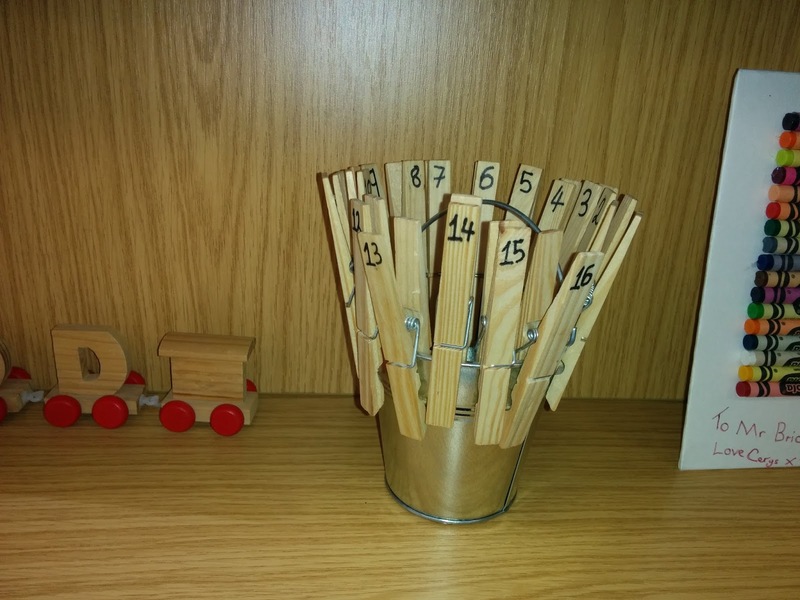 As I referred to earlier, each child will be assigned a number on the first day. This same number will be used for my new behaviour system. I will do a separate behaviour system post another time when I have some more pictures and examples. 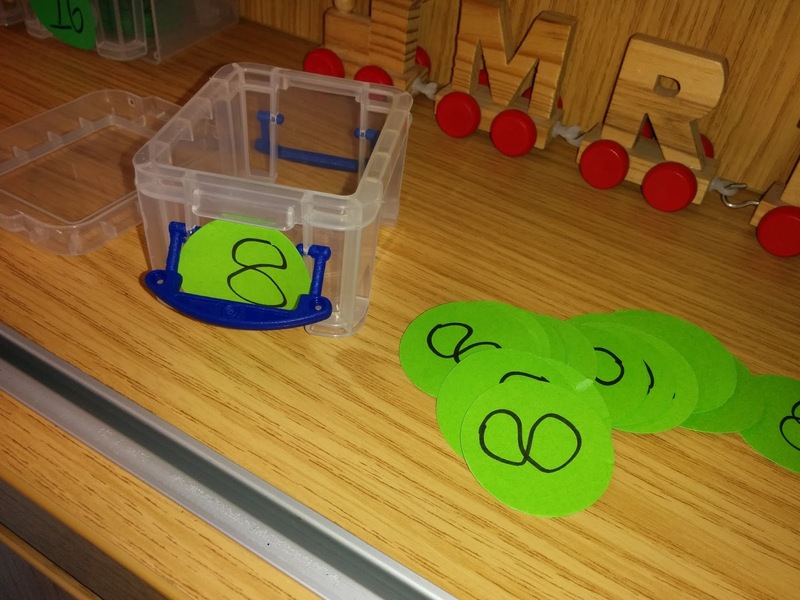 Behind each number is a small box with lots of tokens. When I award a token for good behaviour, the pupil then gets their numbered token and places it into the token bag which can also be seen below. I bought the bag from Amazon for less than £2. In the picture, you can see that above the bag is a poster with the names and numbers of each child so that they don't forget. Throughout the week, tokens will be drawn from the bag to award prizes/give jobs. 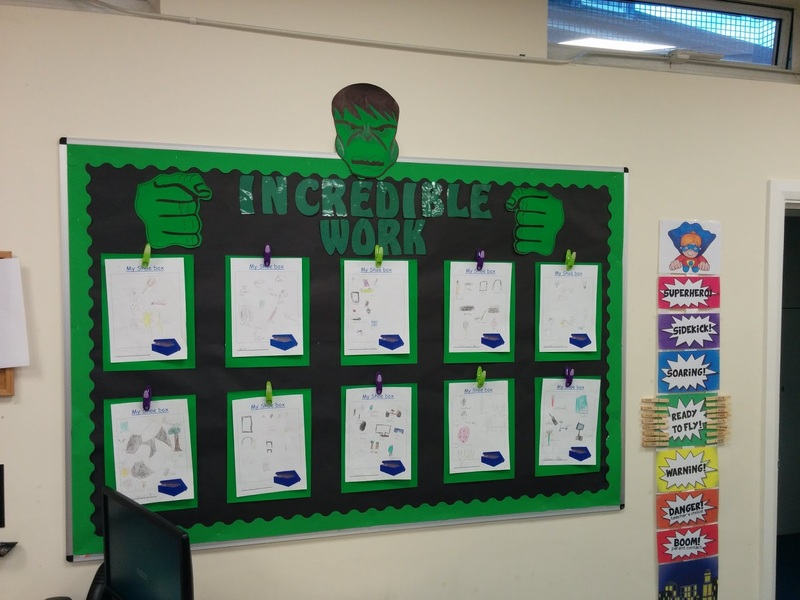 Next up is my improved 'Incredible Work' board. I hot-glued pins to pegs and placed these over some larger pieces of green paper. 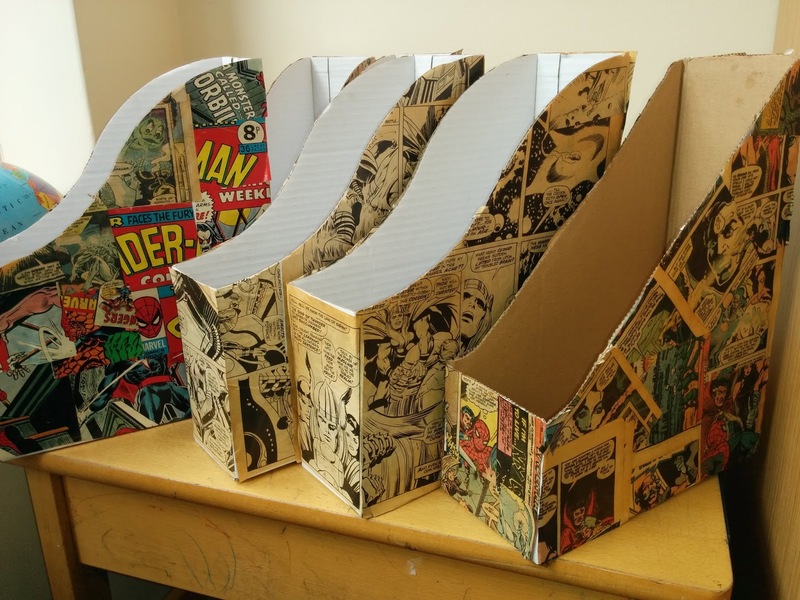 This will now enable me to display amazing pieces of work without damaging it or tearing up the display itself. Very handy. 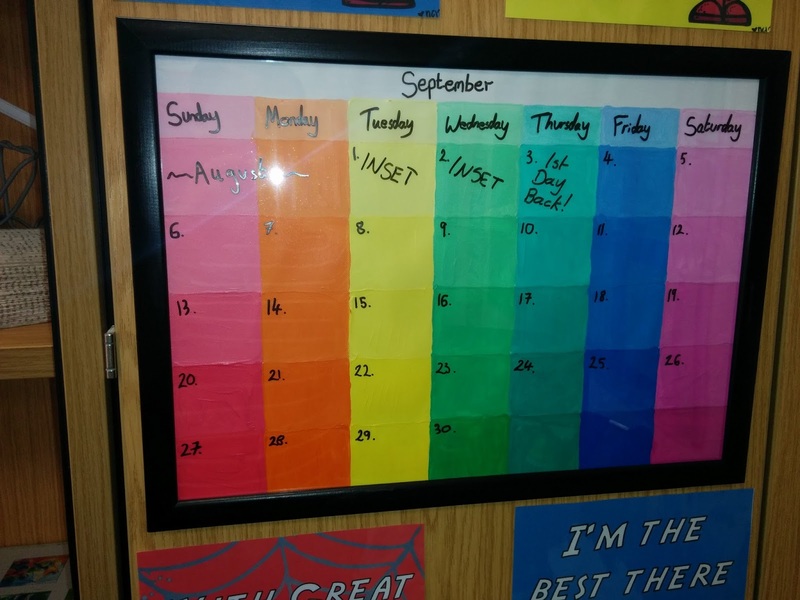 The last addition is this lovely framed calendar that I've seen people make on pinterest. I used acrylic paint to show value in 7 different colours, one for each day. This is all then framed behind glass which gives me the ability to use a whiteboard pen to record important dates/things that the children need to remember. At the end of the month, all I need to do is wipe the numbers and notes off and then write the new month in correctly. 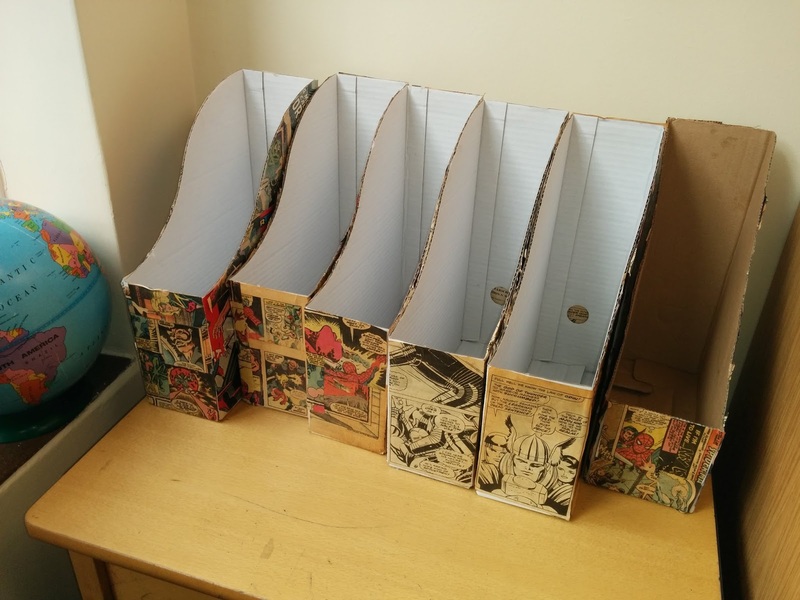 I'll probably do a separate post about this too to give more details about how you can easily make your own.